Lakewood Ranch is a master-planned community set on 8,500 acres of land in the Bradenton/Saratosa area of Florida. The community consists of seven 'villages' offering housing, schools, shops, bars and restaurants. However, over 4,000 acres of the estate has been dedicated to parks, trails, tennis courts, golf courses and other recreational areas. 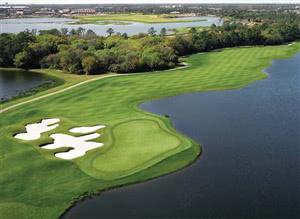 THE LEGACY GOLF CLUB is one of four country clubs within the Lakewood Ranch master community (the others are the Lakewood golf and Country Club, The Concession Golf Club and The Ritz Carlton). The Legacy Golf Club, built in 1997, is a superb Alnold Parmer designed, upmarket, 18 hole championship class 'daily fee' course which has been awarded multiple awards including a 4 1/2 Star rating by Golf Digest and declared 'One of Americas Top Golf Courses' by the ZAGAT Survey 2007-2009. The course features elevated tee boxes with multiple tee positions, 120 yard wide fairways to give an impression of space and a dramatic feel and virtually every hole is framed with sand and water to complete the dramatic feel to the course. The use of multiple tee positions mean that this course can be played to proive a challenge to even the most accomplished of golfers whilst still being approachable to all players. The quality of the course is matched by the quality of the service given at this excellent club, service levels not usually seen outside of a private-members club. The Legacy Golf Club at Lakewood Ranch has fairways and greens of Bermuda grass, water hazards and some bunkers. The course is golf buggy only (no walking). Visitors are always welcome, contact club to make arrangements.